The recent exhibition in the Singapore Art Museum may baffle few, with square picture stickers adding to the complexity of Peranakan design floor tiles in the ticketing foyer and corridor outside the lower galleries. A mixture of newspaper article cut-outs, resized photographs of performance process and artwork delineate the controversial artistic practices of a loose group of artist residing in Ulu Sembawang from 1988 to 1990, their registration of the group under the Societies Act of Singapore in 1992 leading up to the landmark Hong Bee Warehouse exhibition in 1992, and their young successors who continue operated without a former space. Who are these villagers/artists? Why are they so important to warrant a mini retrospective of their artistic practices? 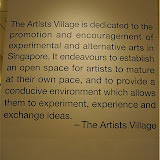 The Artists Village (sic), TAV for short, is more associative than definitive. Like the European Impressionists of the late 19th Century, or the Situationists International once based in Paris in the 60s, the label is used more as a convenience for these group of exceptional and tenacious artists, than a term to describe a singular mode, style, methodology for art making. TAV stood for a certain democracy and freedom of artistic expression, usually through modes associated with action art, live art, or performance art. There are two ways to appreciate the exhibition: Firstly, the showcase of the Singapore Art Museum’s 1990s aggressive collection of avant-garde Singapore Art, and the huge fragmented archive of TAV photographs of events, artists and artworks. 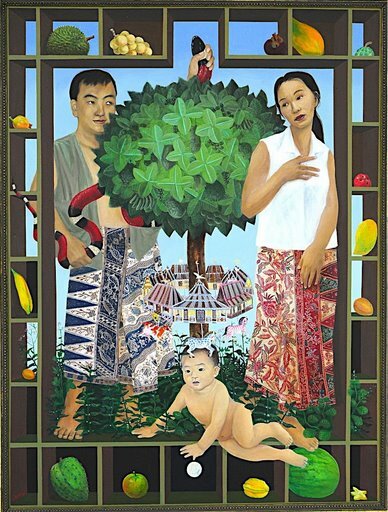 The museum seem to have shifted it’s emphasis on collecting Modern South East Asian Art, rather than it’s local contemporary artists, judging from the type of donated works shown in recent years. The works here, both exhibited and suggested are challenging, thought-provoking and indicate the concerns of artists for the society in the past 20 years, providing a critical lens to view the nation’s rapid development of the 90s. These are fragmented because the viewer has to actively find them in the wall text, the single-channel video interviews of selected artist members, the video in the ticketing foyer, PDF document of the dis-jointed chronology found on the museum’s current website. Secondly, the construct of histories overlap, and becomes a trajectory of personal perceptions and collective memories, seen in the curator’s apparent struggle to piece together fragments of Singapore’s post-modern art history. More different images await the patient audience as amateur researcher, only to find missing dates, missing description of performances, and only to be satisfied with small pictures treated like an 8 Days magazine spread – crammed for editorial space. Doesn’t out memories work in the same way – fragmented, blur and linked in a nexus of ways not necessarily linear? What I ate for breakfast yesterday could be ‘remembered’ after I think about the car I passed on the road that broke down that morning. The exhibition starts and seem to end with the tiles. While the selection of Robert Ern-Yuan Guth’s “Killing nothing but time” to represent the future of TAV, at the end of the illustrated wall timeline is strange, considering his brief 1-2 years participation with TAV, it does illustrate the group’s openness and aesthetics for the banal. While the appreciation of performative, and installation art is largely esoteric, TAV has managed to gather a large following in Singapore, and elsewhere, having proven to be a leading avant-garde artists initiative. While the dates of the exhibition is planned to coincide with National Day (independence day), little reference is made to the country’s recent local social history (1988 – 2008), in relation to TAV’s development. Perhaps this reveals the lack of an onus for documenting local art history. As long as there isn’t a strong institutional acknowledgment, such as a faculty of history of art in the local universities, or private enterprises that collects, archives and makes sense of local art, the problems faced by TAV and the museum will haunt other loose artists groups that lack the means to document, archive and store their art, images, interviews and collective memories. There is a lot of play going on in the paintings, but little pretense in the life of the artist that created them. The family is almost religiously depicted, drawing similarities to the Medieval paintings from Europe, and Rene Margritte’s style and surrealistic themes. 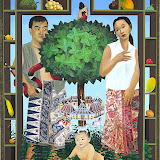 The centre of the paintings, oscillate between subtle statements, suggestions, allegories of the family, and the Malaysian state. The two are congruous. The concept of the state, is not too far of from the concept of the family: in the chinese words for country, 国家 （guojia) it means nation-family, nation as family. The other reference between nation-state and family, is our common reference to the latter as the motherland, and the title puns on this too, referring to the political manoeuvres so often mentioned in the Malaysian news (http://themalaysianinsider.com/). In some paintings, such as the Castle Cake (2007), Mad Tea Party (2007) the political references to the nation-state are stronger. As curator Cecily Cheo puts it, the artists ‘weaves oblique political messages into a visual tapestry rich in fantasy and whimsy’, forming a ‘poetic resistance’ in reaction against Malaysia’s turbulent political cross-fires and allegations, against the backdrop of world-wide oil price crisis and the government’s reactive measures. The exhibition is worth the trip, to the near end of the Singapore island, as it features a vast collection of the artist’s works, showing her growth, and rich symbolism centred around what matters most to her. A while has past since the grand International Symposium on Electronic Art (ISEA) exhibition at the National Museum of Singapore drew to a close, pitching some of the best collaborations between science and art around the world. The exhibition accompanies the various conferences and artists in residence programme, supported by the National University of Singapore. My personal favourites include The Global Bridge Symphony, and The Water Book (An Encyclopedia of Water). The formal exudes the surreal mental image of suspension bridges as the string instruments of the wind, while the latter an interactive water ‘touch’/sensor that reminds me of Hollywood blockbuster Minority Report. I find it a need to highlight Singapore’s contributions, local artist Jason Wee’s So Close the Desert Isle, and Syntfarm: Andreas Schlegel (Germany/Singapore) & Vladimir Todorovic (Serbia/Singapore) SYNBOUTIQUE. While the work is politically charged (visit Singapore Ministry of Foreign Affairs special website), because the fate of the isles determine the sea boundaries, and subsequently national boundaries and precious air space, it strikes little visual chord with the viewer, with its confusing 4 channel projection: the focus seems to be lost, and little artistry is spent on considering the beautiful metaphors of the isles.Of of the turn-offs would be the light-house ‘animation’ that does little to stir any mood. Instead, a set of straight forward projections are cast, expecting the viewer to make their own sense and artistic sensibilities. The imagery is too direct,and flat. A more authentic, heart-moving, effective work that deals with Singapore sea boundaries, without the need to implicate (new) technologies, would be the sea stories series by Singapore artist Charles Lim. The relationship between the video projections and the artefacts are baffling, and fail to get anyone, anywhere closer to nature, or any idea closer to what they are actually interested in expressing. The prototypes, are at best, objects synthesized between man-made objects and animal skeletons. Devoid of colour, and probably 3D laser plotted, they fail to tap into any consumer consciousness, or create any urge to want to own them. But then again, perhaps I am mistaken, and the work requires archaeology, sociology, psychology, digital imaging and artistic direction to comprehend and appreciate it. Perhaps the comments here are harsh, bearing in mind that the artists had to collaborate with institutions and organisations that may not like dealing with the whims and fancies of artists, within the allocated time and budget. Perhaps inclusion in the juried exhibition is better than none at all, it seems. The process of engaging new technologies is more tricky than making a new team. Bruck Tuckman suggests that a new team undergoes four stages: Forming, Storming, Norming and Performing. If the above mentioned works are anything to go by to judge the state of digital arts in Singapore, we are at best in the Forming stage. One of the other pities of the exhibition is the relative low profile, and short exhibition span. For those that managed to catch it, would agree that new technologies and interactive digital media proves to be engaging, tricky and unfathomable: perhaps another sign that we are loosing grip with what we can understand and comprehend in this increasingly digitized, and synthesized age.